Multiple leaks created a frenzy of conflicting stories about the status of Deputy Attorney General Rod Rosenstein Monday morning, sparking rumors that the nation's second-ranking law-enforcement official had tendered his resignation to White House Chief of Staff John Kelly, or was about to be fired. A CNN source said Rosenstein was anticipating losing his job after being called to the White House for a meeting with Kelly on Monday, though new reports suggest that Rosenstein will now meet with Trump on Thursday. The network reported that Solicitor General Noel Francisco would oversee the Russian election-meddling investigation in the event of Rosenstein’s departure from his post. The president has criticized Rosenstein for hiring Robert Mueller as a special counsel to conduct the probe. Rosenstein also approved an FBI raid on the homes and offices of Trump's long-time personal attorney, Michael Cohen, who is cooperating with Mueller to avoid a long prison term on various charges. The deputy attorney general took over supervision of the Russian investigation after Attorney General Jeff Sessions recused himself. Trump has repeatedly called Mueller's inquiry a “witch hunt,” and blasted Sessions for his recusal. Rosenstein is reportedly among those who have privately suggested using the 25th Amendment to remove Trump from office due to mental instability. The official's popularity at the White House took another hit last week, when The New York Times wrote that he had considered wearing a concealed recording device while meeting with the president. CNBC noted that Rosenstein's departure could endanger the Russian investigation, which involves not only collusion but also possible obstruction of justice by Trump for firing FBI Director James Comey in an attempt to end the probe. There has been considerable speculation that the president will fire Mueller, which could spark a political and constitutional crisis. Former President Richard Nixon was faced with impeachment and had to resign after he ordered the dismissal of a special prosecutor who was looking into the Watergate affair in the 1970s. Republicans were advising Trump to refrain from firing anyone at the Justice Department until after Senate confirmation of his nominee for the Supreme Court, Brett Kavanaugh. The appeals court judge is immersed in his own scandal, having been accused by two women of sexual assault. The Justice Department shakeup happened just as Mueller was reportedly beginning to wrap up his work. He has filed charges against a number of the president's associates, including Trump campaign manager Paul Manafort for tax evasion, money laundering, and bank fraud. Manafort reportedly has “flipped” on Trump, agreeing to tell Mueller about the Russian connections in exchange for not being indicted for additional crimes. 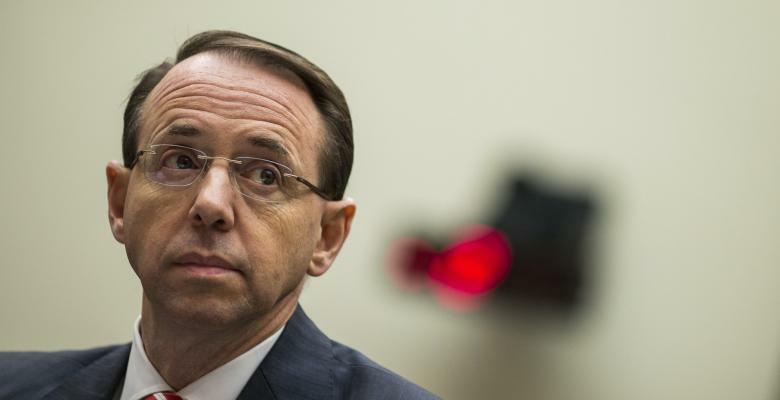 It is unknown whether Francisco will continue Rosenstein's support of the probe, or refuse to grant Mueller's requests for raids and indictments if Rosenstein either leaves or is fired. The solicitor general could fire the special counsel. Less than a day before the hearing, the Justice Department released text messages critical of the president written by FBI employees Peter Strzok and Lisa Page. Strzok called Trump an “idiot,” echoing a sentiment that several White House officials have expressed. Other messages focused on having some sort of “insurance policy” in case Trump won. Strzok and Page discussed the need to investigate the campaign's links to Russia, according to the Wall Street Journal. Mueller fired Strzok in July, but the president and his allies continue to claim that Democrats are running the investigation. They are not dissuaded by the fact that Mueller is a Republican.